The bats and gloves have been dusted off, infield and base paths raked and dugouts and bullpen properly stocked with buckets of sunflower seeds. That can only mean one thing: Opening Day is upon us. A recognizable Georgia State baseball team, hoping to build upon a productive 2013 season, returns to action on Friday afternoon to face the Big Ten’s Illinois Fighting Illini. Frady acknowledged the move into the Sun Belt Conference as well as the team’s tough non-conference schedule—a 3-game set with Illinois to open the season, a road series versus Mississippi, two games versus cross town rival Georgia Tech and a road matchup versus the University of Georgia. These games will provide quite a challenge for this year’s Panthers. The pitching rotation returns four weekend starters from last year’s squad. Senior Andrew Fessler, a southpaw from Dallas, Ga., was one of the team’s top pitchers last season after posting a 6-2 record and 3.04 ERA. He threw a team-high 77 innings and fanned 51 batters. Matt Rose will be another key piece of the Panthers’ pitching puzzle. 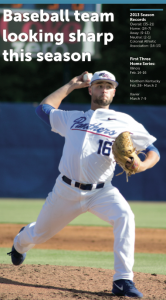 The former draft pick of the Toronto Blue Jays started three games and earned five saves for Georgia State last season. His potential on the mound and his ability to contribute as a corner outfielder earned Rose a preseason All-Sun Belt Conference selection from Perfect Game college baseball writer Kendall Rogers. Frady said the addition of several junior college transfers has also bolstered the pitching staff this season. The diversity of arms—10 righties and eight lefties—gives the team a variety of options in late game matchups, according to Frady. A pitcher’s best friend is solid run support, and last season, the Panthers ranked third in the nation in batting average and fifth in runs per game. With a majority of that lineup still wearing Panther blue and white, crooked numbers on the scoreboard could be a regularity at Panthersville. All-Americans Chad Prain and Chase Raffield paced the team’s offense last season and will be relied on again in 2014. Prain, a senior shortstop from Valdosta, Ga., finished No. 11 in the nation in batting average (.394) last season and totaled 89 hits, two shy of the school record. He joined Rose on the preseason All-Sun Belt Conference list. Raffield, a native of Cochran, Ga., led the team in homeruns (10) and RBI (51) last season and finished in the top 25 nationally in batting average (.382) and slugging percentage (.645). The Panthers will open the season versus Illinois on Feb. 14 at the Georgia State Baseball Complex. First pitch is scheduled for 4 p.m.